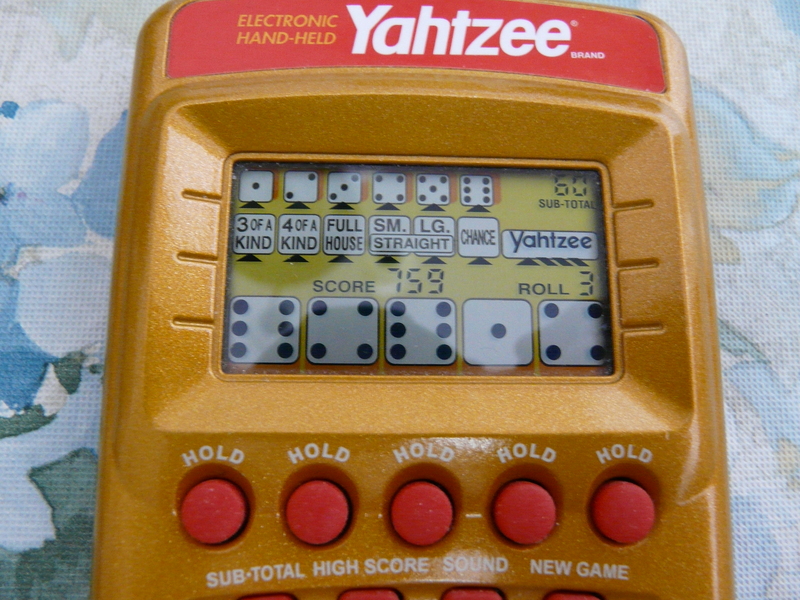 I played many hundreds of games of Yahtzee until 2009, when I achieved the "holy grail" of 759 points. I missed getting the upper-section bonus by three points, but made up for it with six yahtzees, though the game display can only show a maximum of four. If I'd gotten those three extra upper-section points, the total would have been 797. Another three beyond that and it could have been an 800-point game [sigh]. After that, the challenge of bumping my best score up a few points was hopeless. So I switched to Solitaire (known to purists as Klondike), where the score is one's "lifetime" winnings and climbs endlessly over time. Each new game "costs" you 52 points, one for each card in the deck. You then "win" five points for each card moved to a foundation pile. It takes ten or eleven such cards to cover your "cost" and break even. Any additional cards moved to a foundation increases your ongoing point total. Of course, fewer than ten cards in a game is a loss. The decision to document my growing Solitaire point total was made when I reached a score of 234567 points. Since then, I've randomly captured scores that seemed "significant" at that moment. I don't know why, but failed to notice when the lesser score of 123456 points was reached, so it's not documented. Once I reached the half-million-point mark in Solitaire, I achieved yet another personal holy grail. I suspected that further pursuit of higher scores would lose its appeal. Alas, I still play Solitaire, but I'm keeping an eye out for another game to hold my attention.